As with many other country estates in the Netherlands, the owner of country estate De Groote Scheere was forced to seek new ways to provide for the upkeep of his estate. Funds were required to maintain the woods, and the agricultural sector was going through a difficult period. 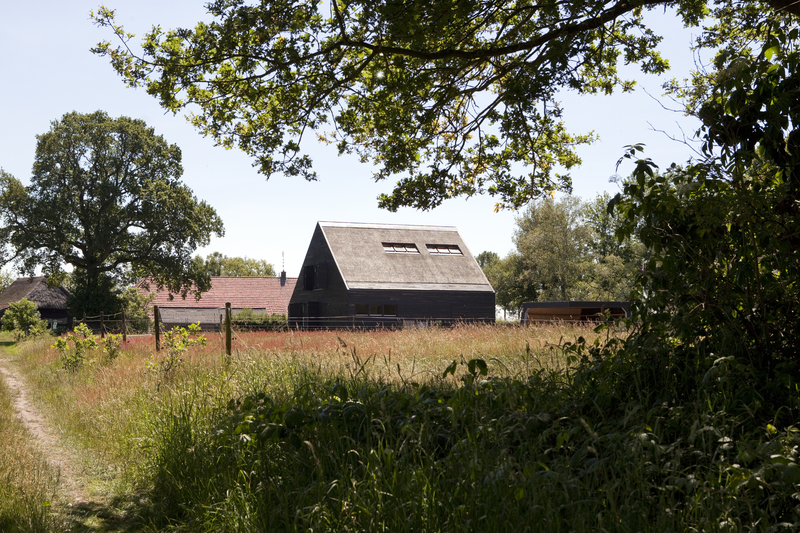 In 2003, the former Fortis Vastgoed Landelijk (Fortis real estate, national office) commissioned Bureau B+B to create a vision and visual quality plan concerning the residential use of the estate, with new development as one of the project’s economic mainstays. 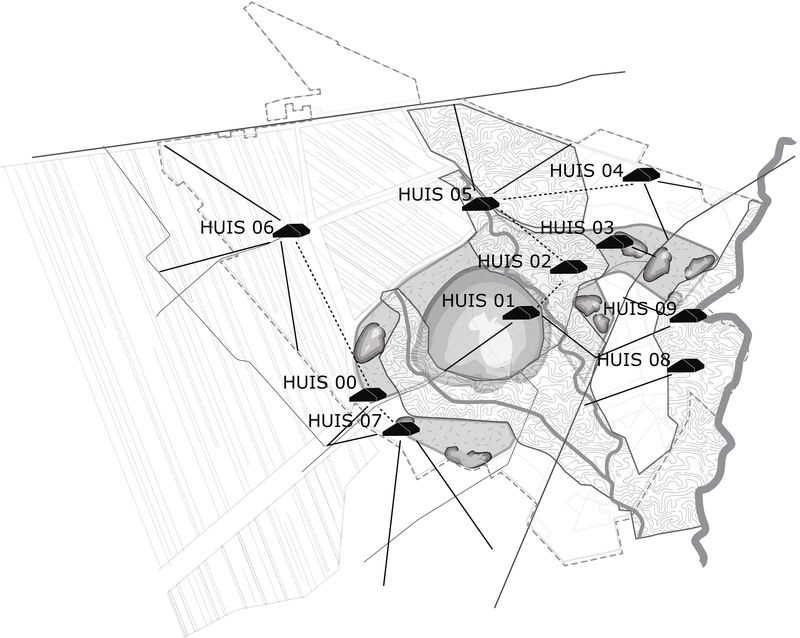 De Groote Scheere is characterized by a simple and modest form of development in an extremely diverse cultural landscape where European ash trees, stream valleys, retention areas and peat polders intersperse. The firm’s ambition was to apply an architectural approach to landscape architecture. Ten new homes are located to the most attractive, and, in landscape terms, most meaningful spots of the estate. One or two homes are always visible from the estate’s main roads, and from different vantage points. Thus, the structures are not carefully ‘tucked away’ in greenery, but on the contrary, they take a prominent position on the 800-hectare estate. Both their locations and images create a recognizable unified architectural language. For each home, the characteristic relation of forms found in timber-framed hall-farmhouses were taken as the starting point. With regard to the remaining components, generous use was made of region-specific traditions: the wolfseind (a gable-roof with two beveled surfaces on its short sides) as a place where witches cannot sit, varying façade heights, modified to suit the different farm animals, and a road through the sides of the barns for loading and unloading. The most unusual component, a pleated roof whose proportions are ¼: ¾ of the face, adapts itself to, and dramatizes, the landscape of its location. The roof’s pleats define the area of the farmyard, where residents have independence in regards to content, and where a range of functions is located. While the homes belong to the same ‘family’, each one distinguishes itself from the others. The field house, for example, is a narrow residential house beside a ditch; the border house bridges a difference in height, the reed house stands in the middle of expansive reed landscapes and is accessible via a high footbridge, and the brook house is transected by a water channel. Bureau B+B designed the pilot home, dubbed the ‘entrance house’, which was completed in 2009. This structure signifies both the end of an old fen ribbon village and the beginning of the estate. The spatial arrangement, design, and materialization of the home were inspired by the historical principles of development characterizing the farms on the estate. 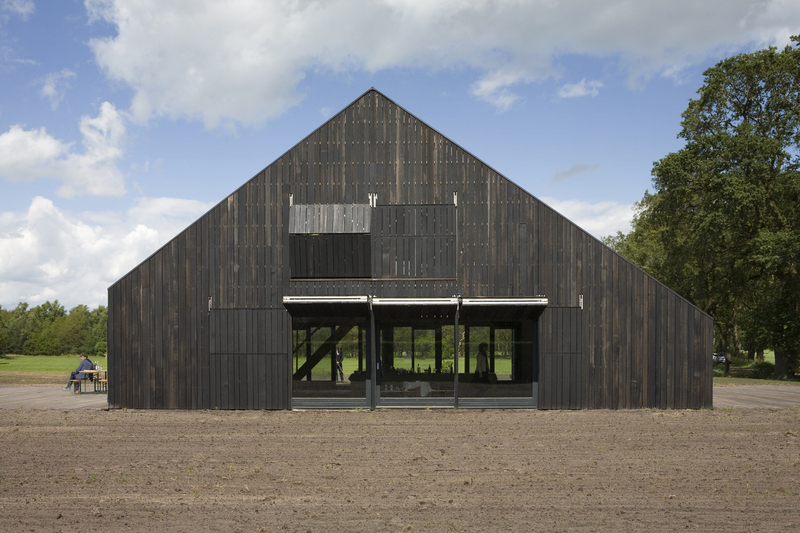 With its uncluttered lines, the building resembles a simple barn. Both home and farmstead were constructed from the same type of material, so that the two appear to merge into a single long, narrow strip. As a result of the small height differences present, the wooden terrace is located just above the landscape, making a boundary of the private space unnecessary. The shutters also play an important role in the façade’s appearance: they open upwards and thus simultaneously function as awnings. Black, open-seamed floor planks used as the façade cladding result in an unusual light incidence. The reed of the roof does not, as customary, hang over the external walls, but is sunken into the roof. As a result of the structure’s flexible framework, there are no walls in the interior, yielding a single large interior space. 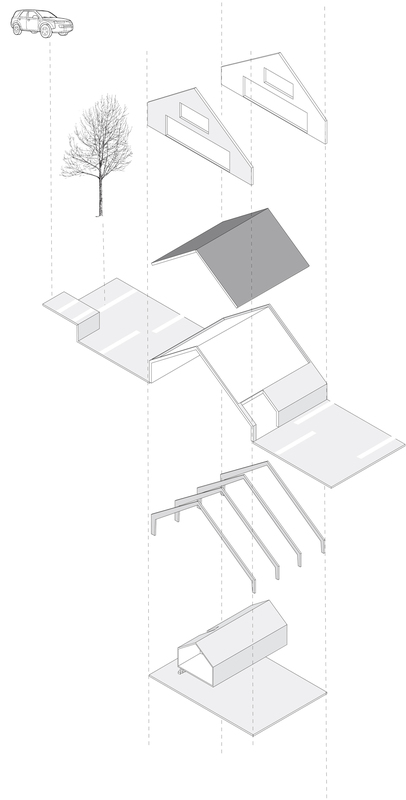 In accordance with the principle of an old hayloft, the upper floor is suspended in the middle of this open space. The interior is furnished in accordance with the wishes of the future resident. Ten new homes are located at the most attractive, and in landscape terms most meaningful spots of the estate. The spatial arrangement, design and materialization of the home were inspired by the underlying historical principles of development of the farms on the estate. 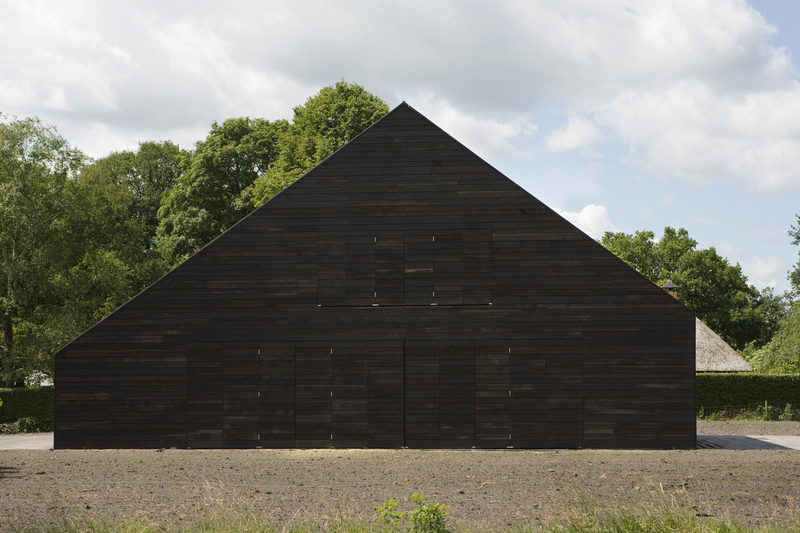 With its uncluttered lines, the building resembles a simple barn. Shutters play an important role in the façade’s appearance: they open upwards and thus also function as awnings.